So much modern architecture is bland, built to a cost, and does not have any features that associate the building with its location or the activities carried out by the occupants of the building. The same style and designs can be found across the country and indeed globally, whilst a trend towards relatively short-term occupation has driven design of buildings to provide a flexible shell and interior which can support many different occupiers over the life of the building. I have previously written about buildings such as 262 High Holborn, Imperial Chemicals House and the Faraday Building, all of which were designed with decoration to illustrate something about the occupier of the building, or the activities carried out within. I found another building recently, one which I have walked past many times and had not noticed the decoration covering one part of the building. across five floors of the facade. The building dates from 2002 and the architect was Squire and Partners. At first glance it looks like another standard office design with no redeeming features, however if you look at the right hand edge of the building, above the large street number 111, there is an intriguing design running from the first floor to the fifth. Study the design and it clearly appears to be a street map, carved in Portland stone panels. It was created by the artists Langlands & Bell following a competition to work with the architects on the design of the building. The street map represents a vertical segment of the local streets running north from Savoy Hill at the bottom of the map to the junction of Catherine Street and Tavistock Street. I have tried to align the map on the building to the actual street map from Google. This is shown below. I have outlined 111 Strand in blue. The scaling of the two maps is slightly different, so they do not exactly align at the same level, however the area covered by the Portland stone map is very clear in the Google map. From Savoy Place at the bottom of the map, it crosses Savoy Hill and Savoy Row to the location of 111 Strand. Then across the Strand to the location of the Lyceum Theatre and the junction of Wellington Street and Exeter Street, then across a diamond shape plot of land bounded by Exeter Street, Catherine Street, Tavistock Street and Wellington Street leading to where the top of the map is reached. I really like the idea of having a street map carved on the facade of a building. 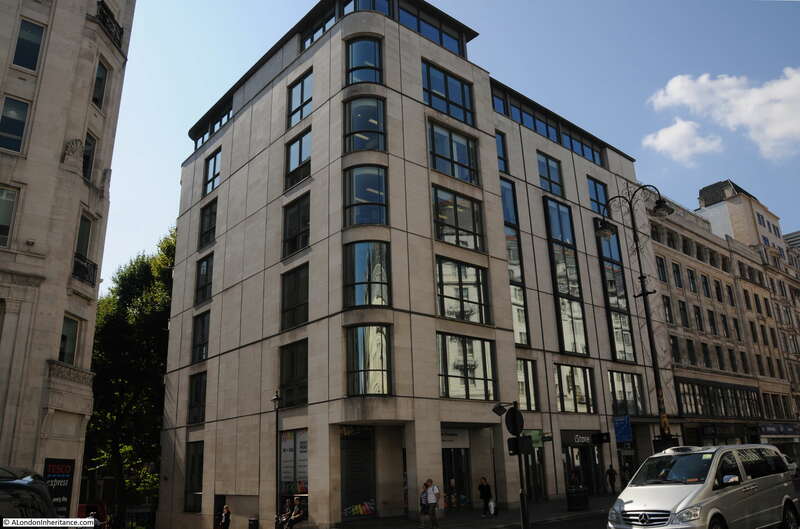 It acknowledges the surrounding landscape and that the building is part of this landscape, however I do wonder why 111 Strand was not marked on the map to place the building within the surrounding streets. Interesting also the scope of the map. The River Thames is only slightly further to the bottom of the map and would have placed 111 Strand in relation to the river, which would also help explain why the Strand is named as it is. I do like the attention to detail. 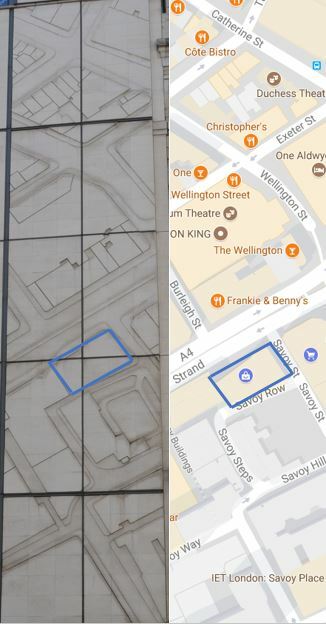 If you look at the diamond-shaped plot of land at the top, the number and shape of the buildings along Tavistock Street at the top of the diamond are the same as in the Google map. Also within the diamond, the large block of the Duchess Theatre can be clearly seen. 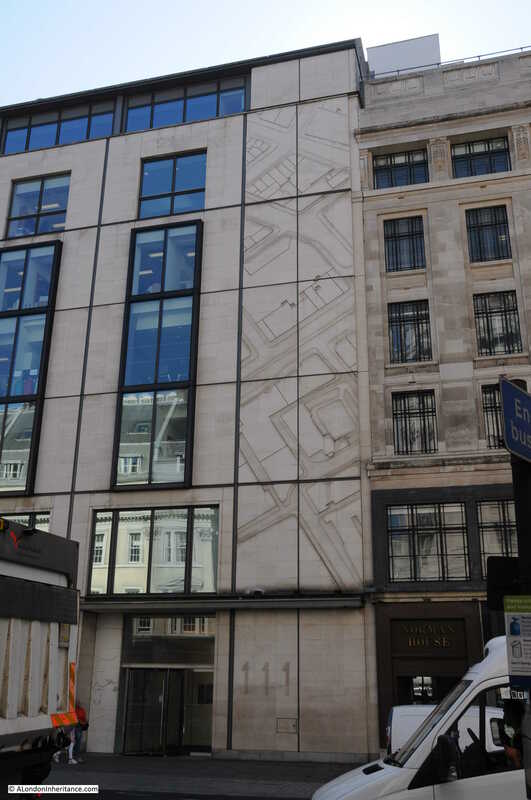 I have no idea how I have missed this stone map in the fifteen years since 111 Strand was completed – I must be looking at new buildings with an inbuilt assumption that there is nothing of interest to see – I will have to pay more attention to more recent buildings in the future. This entry was posted in London Buildings and tagged 111 Strand on September 14, 2017 by admin. That’s fascinating – coincidentally, I am heading for Somerset House this morning so will be able to see 111 in the flesh. The footage for Bob Dylan’s Subterranean Homesick Blues was shot at the intersection of Savoy Steps and Savoy Hill, just to the east of the grey shaded area. It’s arguably the world’s first pop music video and you can find websites discussing it. How did he stumble upon such an obscure spot? Well like any self-respecting anarchist hippie he was roughing it at the Savoy. So this weekend I am going to look at the building. Well, I never! I don’t like much modern architecture but I’ve been rather fond of 111, though I’d never noticed the map.